President Donald Trump delivered the State of the Union Address on Tuesday. Meanwhile, Hawaii may raise the minimum smoking age to 100 years old by 2024, 21 Savage was taken into custody by ICE, Demi Lovato deactivated her Twitter, and a student in North Carolina found a man in her closet. Even if you’ve been living under a rock, there’s a good chance you were at least vaguely aware of President Donald Trump’s State of the Union Address delivered at 9 P.M. EST on Tuesday. There had been controversy prior to the State of the Union last night. 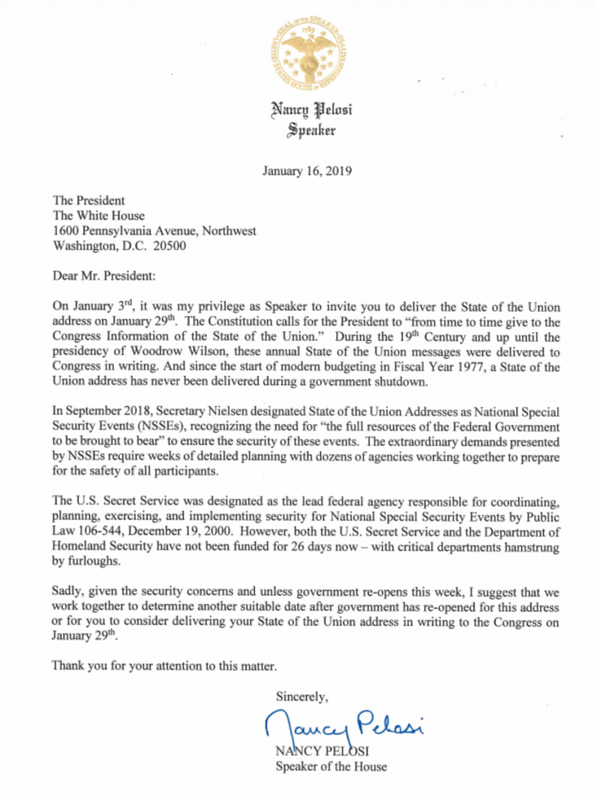 During the 35-day partial shutdown of the U.S. government, Speaker of the House Nancy Pelosi had asked the president to postpone his address – originally scheduled for Jan 29 – until after the government had reopened. Sadly, given the security concerns and unless the government re-opens this week, I suggest that we work together to determine another suitable date after the government has re-opened for this address. With the government temporarily reopened on Jan 25, President Trump delivered his State of the Union Address from the House of Representatives in Washington D.C. on Feb 5. President Trump continues his bipartisan take by later advocating for the common good in the face of political revenge, resistance, and retribution. 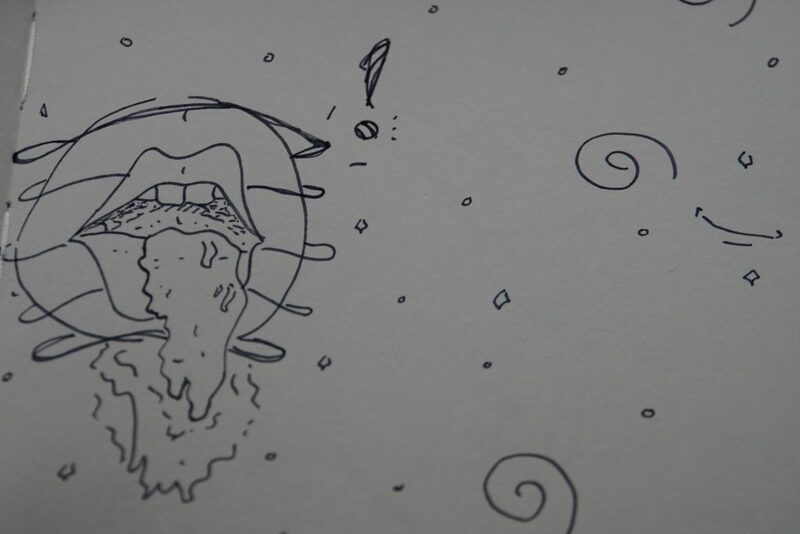 However, actions speak louder than words. After all, isn’t this the same president who nabbed his nomination by mercilessly slinging mud within his own party as well as across the aisle? In any case, President Trump asked for investigations to cease, acknowledged the women in Congress, as well as women in the workforce. The president also discussed the economy, global affairs, the national drug crisis, immigration, NAFTA, and socialism throughout the State of the Union Address. The full address is available on the CBS News YouTube channel. CNN has released a full transcript, as well as five key takeaways. Vox has also compiled the “winners” and “losers” of the night. What Else is Going on in the World of Politics? Rep. Richard Creagan (D-South Kona/Ka‘u) proposed a bill that would raise the minimum age to legally smoke cigarettes in HI to 100 years old by 2024. By this point in time, the health risks of smoking tobacco products have become well known across the globe. According to the American Cancer Society, cigarette-related illnesses take the lives of more than 480,000 Americans annually. The death toll is higher than that of alcohol, car accidents, HIV, guns, and illegal drugs combined. Creagan does admit he had smoked cigarettes throughout his medical residency in an attempt to stay awake during long shifts. However, the legislator believes E-Cigarettes, cigars, and marijuana are safer alternatives. On Jan 26, Extremely Wicked, Shockingly Evil and Vile starring Zac Efron as Ted Bundy premiered at the 2019 Sundance Film Festival. Extremely Wicked, Shockingly Evil and Vile has received a lot of buzz. While New Musical Express (NME) reports the consistent praise Efron has received for his performance, both VICE and the Huffington Post warn of the dangers associated with sexualizing a narcissistic serial killer. In any case, Netflix has already purchased the film for $9 million, according to The Hollywood Reporter. On Sunday, rap artist Sha Yaa Bin “21 Savage” Abraham-Joseph was taken into custody by U.S. Immigration and Customs Enforcement (ICE) as an “unlawfully present United Kingdom national” according to NBC News. The rapper has been convicted on felony charges of staying in the United States 13 years beyond the expiration of his visa. Of course, the internet being… well, the internet, took to platforms such as Twitter and Instagram with memes related to 21 Savage’s arrest. 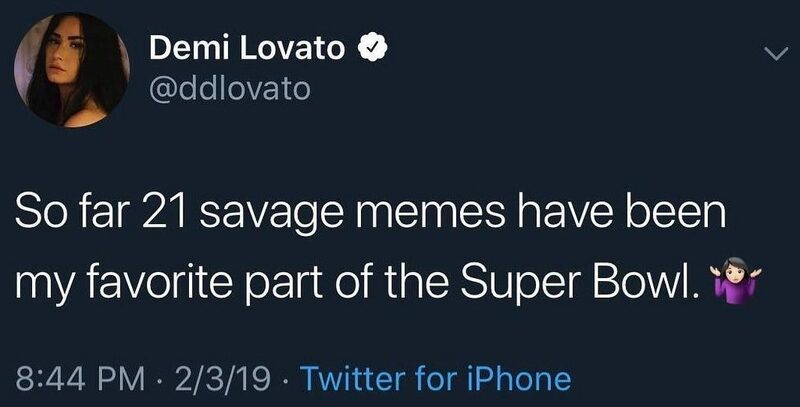 Singer-songwriter Demi Lovato received intense backlash on Twitter after Tweeting about 21 Savage’s arrest during the Super Bowl LIII. Lovato deactivated her Twitter that night and explained her reason for doing so in an Instagram Story on her profile. According to The Wrap, Lovato was called a “junkie” and “crackhead” across social media platforms. Other comments urged her to use heroin as a nod towards her overdose in July 2018. CBS’ upcoming Twilight Zone reboot was also announced on Sunday by Jordan Peele during the Super Bowl LIII. Lastly, the New England Patriots won the Super Bowl LIII against the Los Angeles Rams in the lowest-scoring Super Bowl of all time, according to CBS Sports. What Else is Going on in the World? On Saturday, a student at the University of North Carolina by the name of Maddie finally confronted the “ghost in her closet” Although she didn’t find a ghost, her bravery lead to a discovery far more haunting. “Oh, my name’s Drew,” Andrew Swofford replied in response to Maddie as she asked who was in the closet, according to The Washington Post. Maddie stopped Swofford as he tried to push the door open and unsuccessfully attempted to dial an emergency call from her Apple Watch. The student caved and let Swofford out after he agreed not to hurt her. “I open the door and he’s in there, wearing all of my clothes,” Maddie said to Fox 8. Swofford begged her not to call the police. Instead, Maddie called her boyfriend as Swofford continued to display odd behavior. Swofford tried on her hat and called Maddie pretty before asking for a hug. However, she confirms that he did not touch her. Swofford was arrested at a nearby gas station shortly afterwards, spokesman for the Greensboro Police Department Ronald Glenn Jr. said to The Washington Post. Swofford was convicted of a misdemeanor on the accounts of breaking and entering. The man already had a criminal record of larceny and failing to appear before the court prior to this arrest. Currently, Swofford is in the custody of the Guilford County Jail with a bail of $26,000. Rep. Richard Creagan (D-South Kona/Ka‘u) proposed a bill that would raise the minimum age to smoke cigarettes to 100 years old in HI by 2024. Extremely Wicked, Shockingly Evil and Vile starring Zac Efron as Ted Bundy premiered at the 2019 Sundance Film Festival on Jan 26. The film, which has received a lot of buzz, has already been purchased by Netflix. Sha Yaa Bin “21 Savage” Abraham-Joseph was taken into custody by U.S. Immigration and Customs Enforcement (ICE) as an “unlawfully present United Kingdom national” on Sunday. Demi Lovato deactivated her Twitter after intense backlash following her tweet about 21 Savage’s arrest. CBS’ Twilight Zone reboot was announced by Jordan Peele during the Super Bowl LIII. The New England Patriots won the Super Bowl LIII against the Lost Angeles Rams in the lowest-scoring Super Bowl of all time. A student at the University of North Carolina found Andrew Swofford in her closet and wearing her clothes on Saturday. Swofford was later arrested at a gas station for breaking and entering. 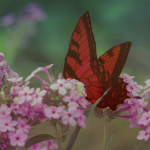 This entry was posted in Blog, Entertainment, 2019, Winter 2019, February 2019, Blog, Politics, Blog, What in the World Wednesdays and tagged in 21 savage, abraham-joseph, andrew swofford, blog, blogs, burgundy bug, cigarettes, closet, creagan, demi lovato, donald trump, drew swofford, entertainment, hawaii, hi, ICE, immigration, lovato, media, news, newsworthy, north carolina, politics, president donald trump, president trump, richard creagan, shaa ya bin abraham-joseph, sotu, state of the union, state of the union address, what in the world, what in the world wednedays 6, what in the world wednesdays, what in the world wednesdays #6, What in the World Wednesdays #6: Going up in Smoke.